PHOTO BY MATT DETURCK LOVE, at 45 Euclid Street, uses projectors and an audio-visual system to set the club's tone. 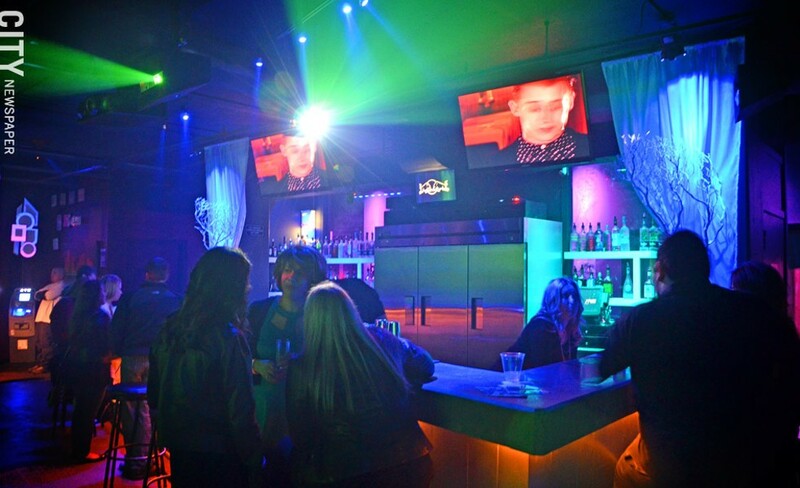 Tucked off Chestnut Street, at 45 Euclid Street, is a little club with a lot going for it. I visited LOVE with two companions on a blustery Friday night in late March. The place wasn't difficult to find but we weren't sure where to park, and frankly, a little police presence would have been nice around those deserted lots. But I guess we weren't in Kansas — er, um — the East End, anymore. Once under the welcoming neon lights of LOVE, the entrance flanked by doormen, I felt the familiar twinge of underground club excitement. We could have been on a side street in Williamsburg, Brooklyn, or Manhattan's Lower East Side. Inside, a courteous attendant at the ticket counter checked our I.D.s and stamped our hands. No guy on a stool by the door, but a real hostess; a nice upscale touch. Once inside, we stood still, entranced. The audio and visual experience at LOVE is an impressive integrated system with projectors that produce detailed images on any wall space. The visualizations interact with the music, the movement of the audience and whatever other creative hijinks the DJ wants to throw in. It's mesmerizing. LOVE is the brainchild of Jason Crissy who was the General Manager of Tilt nightclub for six years (during which time period Tilt regularly won CITY's Best of Rochester award for Best Nightclub). This new baby opened in October. "It was time for me to do my own thing. I wanted to run with my video idea," Crissy said. He credits Richard Kishita as the man behind the curtain in creating the visual effects. What LOVE has produced is a futuristic, interactive visual and audio playhouse that has a definite rave-like vibe. The majority of the music is EDM. A host of house DJs have their regular nights and the names ring familiar from the Rochester club scene. Thursdays it's resident DJ Rich Kishita and weekly guests spinning drum & bass and electro. On Fridays, DJ Transcend spins tech house, progressive, and top 40 remixes from 10 p.m. to 2 a.m.; afterhours is with DJ Victor Gig. Saturdays, Resident DJ Jameson Alexander plays from 10 p.m. to 2 a.m. spinning electro, techno, progressive and remixes, then DJ Rob Morley takes over afterhours. LOVE also regularly features special theme nights and is available for private parties. We happened to be there on a First Friday which was a Pure Whirl night. I didn't ask for an explanation, but I'm assuming the name was a reference to the handful of 18-plus club-goers who came equipped with LED hula-hoops, batons and light sticks. Some of the kids sported a Darkwave look; one girl gyrating her hoop with something akin to the dexterity of a Cirque du Soleil performer wore a black cap, skirt, leggings, boots, and a wide silver belt. Others were casual in sneakers and jeans. "I come here because there's lots of space to hula, they have cool visuals and change the music a lot," said Marisa Church, a 21 year old from Henrietta. But the LED crowd covers only a fraction of LOVE's patronage. Seated at the bar with us were 20-, 30-, and 40-somethings. Everyone seemed to be relaxed and enjoying themselves, letting the audio-visual experience of the place wash over them. I was in no hurry to leave. My drink was good, my body was vibrating with the music, and the LED dancing was fun to watch. Different drink specials run every night. Thursdays it's $2.50 wells and Budweiser products until midnight; Fridays and Saturdays it's 2 for 1 signature drinks until 11:30 p.m. Signature cocktails are uniquely named, tasty and served graciously. I enjoyed a True Romance made with Grey Goose vodka, lemonade, melon liquor, and Tyku. The cocktail didn't fill my martini glass to the top, but at 2 for 1 (for $8), I wasn't complaining. While we took it all in, Crissy proudly explained that LOVE's sound system consists of 16 extended, low frequency subwoofers system delivers musical bass and clarity while eliminating harshness that typically leaves ears ringing. Instead, you feel the music in a much cleaner way. It's definitely worth checking out. Cover cost and age restrictions vary depending upon the night at LOVE. Thursdays, it's $12 for ages 18 and older, half off with college ID. For the 21 and over crowd, entrance is free until 11 p.m. and $3 after that. On Fridays, it's only 21 and over until 2 a.m. — free before 11 p.m. and $3 after — but 18 plus are welcome for afterhours, 2 to 4 a.m. for $10. Same deal for Saturdays except the over 21 crowd pays $5 to get in from 11 p.m. to 2 a.m.